I finished the Responsive Web Design course on freeCodeCamp. I really learned a lot! I didn’t realize how dated my HTML and CSS skills were. 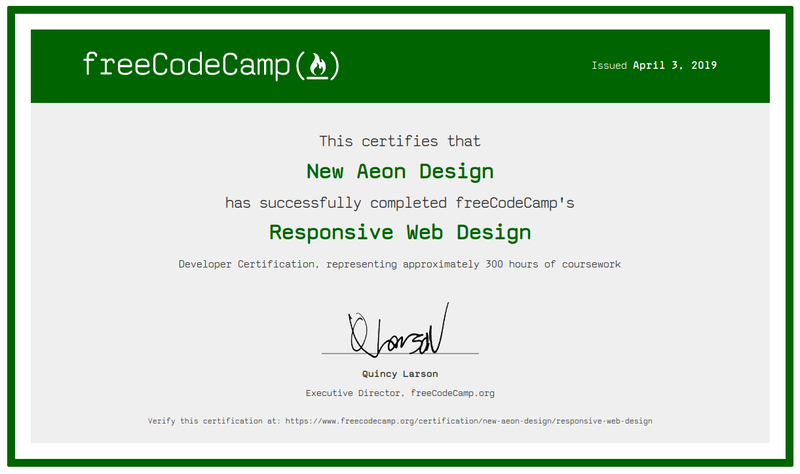 So much so, I’ll be working on a site redesign for new-aeon-design.com. Can’t wait to incorporate all the new stuff I learned. I’ve currently been working on code related projects at least 3 – 4 hours a day. Sometimes longer. This entry was posted in Certificates, html css, twitter and tagged awards, certificates on April 5, 2019 by NewAeon.